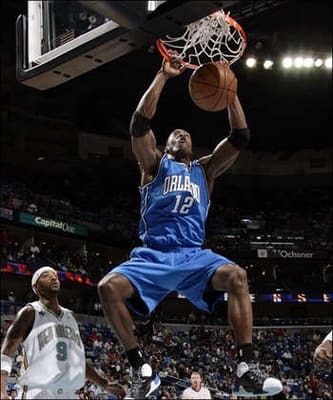 Dwight has averaged a double-double since he put on a Magic uniform. Straight out of high school he was a physical marvel. It doesn't get much better than a young 7-footer with unlimited potential. All Howard has to do is keep working on his post moves and his 15-footer, other than those two areas he has a chance to be mentioned among the giants. In his fifth year, Superman led the Magic to the Finals, but lost in five to the Lakers. He can also be a little meaner, although, he did just get his coach fired like he wanted, but reportedly he still wants a trade. Ease your thirst, Laker fans.